One of the benefits to Google Cardboard, Oculus Rift, and similar phone-based headsets is stereoscopic 3D. As a big supporter of stereoscopic 3D, what I want to do is to rip 3D Blu-rays I own to side-by-side 3D files that I can play from Plex server through my Roku onto my 3D TV. Besides I decided to play around with converted 3D files on Cardboard/Oculus Rift. I am just wondering what would be the best way to go about it? In fact, I would say I’m somewhat of a Blu Ray ripping novice. I usually use the disk. 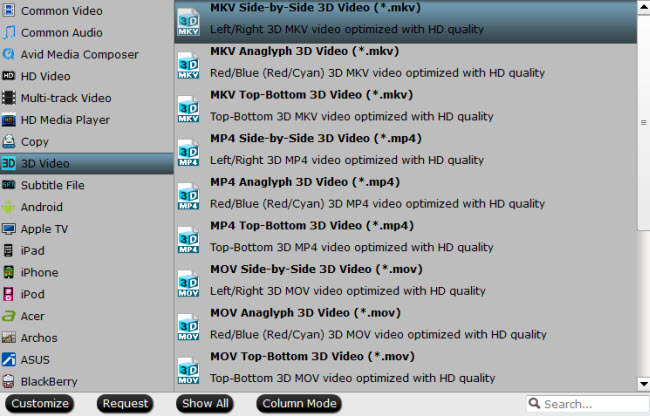 I’ve been experimenting with a pile of 3D Blu-ray ripping tools and finally decide one. 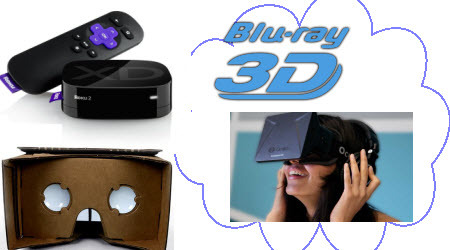 Now I’m sharing the way to convert and play 3D Blu-ray for Roku, Google Cardboard, or Oculus Rift with ease. A program to strip the idiotic AACS encryption from the Blu-ray. Here I found Pavtube ByteCopy (Read review) which aims to solve this problem by giving us the ability to rip our purchased physical 3D Blu-ray discs to 3D SBS video for watching on Google Cardboard, Oculus Rift, 3D TV via Roku as well as other 3D players. In addition, it’s professional in ripping and converting Blu-ray/DVD discs, Blu-ray/DVD ISO image, Blu-ray/DVD copies and more to a decent format you want. Also, it will help you backup your 2D/3D Blu-ray disk and save the time looking for them from the cardboard with ease. If you are working on Mac OS X, please get the mac version. If you have backed up 3D Blu-ray in ISO files, just instal Virtual CloneDrive, right-click on the ISO and select “Mount Virtual CloneDrive drive_letter”. That ISO will then be available as whatever drive letter was listed. If you saved the Blu-ray image to a directory with the same file structure, skip step 1. 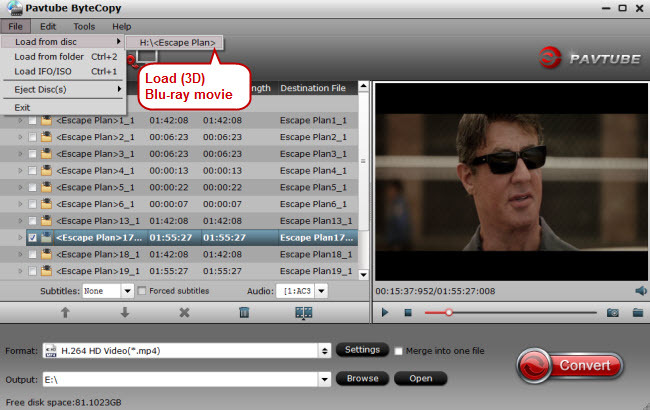 Insert your Blu-ray disc into your BD drive, run ByteCopy and click “BD/DVD disc” icon to load 3D Blu-ray movies. Click the format bar to follow “3D Videos” and choose the 3D Side-by-Side MP4 format which can fit your 3D devices perfectly. Click the convert button under the preview window, and the Blu-ray ripper will start the conversion from Blu-ray movies to 3D SBS video. If you want to play this on a VR headset like Google Cardboard or Oculus Rift, use the steps from rokoding.com, and then go back to the Video tab to adjust the width and height of the final file, as described in the next step. Don’t click Start just yet! There are a few things about VR playback that you need to be aware of. The biggest is that you likely will not be able to see the entire screen, but perhaps 70% of it. The extreme sides will be out of your field of view. This is due to the depth of field view and the focal point of the headset. The immersion of 3D or VR in general is slightly broken if you can see edges when running a VR application or game, so edges are placed out of view. We’re watching a movie with a static location, so we don’t need to worry about 360 degree immersion. 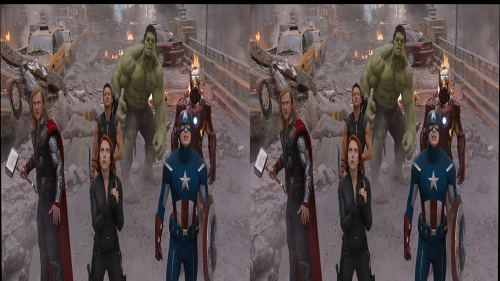 Unfortunately, the only way to fix this when it comes to 3D movies is to reduce each eye’s half of the frame relative to their own virtual center as shown in the example below. So, go ahead and have some fun with this! Let me know how successful you’ve been, but please note that due to spambots the comments are closed after a certain length of time. Enjoy — Watch 3D Blu-ray on Google Cardboard, or Oculus Rift and 3D TV via Roku freely. but don’t be part of the problem! If you keep pirating 3D Blu-rays, what incentive does Hollywood have to release them in the future?